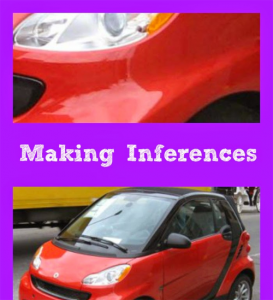 My guest post on Minds in Bloom, which is all about making inferences, includes inference questions for the pictures books The Stranger by Chris Van Allsburg and Riding the Tiger by Eve Bunting. One interesting idea might be to begin a lesson on inferencing with the photo activity described in that post, and then follow up with either of these two picture books. Either one would be a great story for teaching the skill of making inferences to middle grade kids. The Stranger features a mysterious main character who will have the kids guessing about what is really going on, and Riding the Tiger includes symbolism that will definitely give them some things to think about. I’ve suggested some questions to start with, and there are lots of passages in either book that would work well for developing more inferencing questions of your own. Here is a link to my post on Minds in Bloom. If you are looking for more resources on inferencing and other reading skills, take a look at these in my Teachers Pay Teachers store. I love the two books: Riding the Tiger and The Stranger. Do you know of any other books that are similar where the students need to provide evidence about who the book is about? I don’t, but I’m going to keep this in mind as something to look for in picture books.